We’ve all heard that an ounce of prevention is worth a pound of cure. What you may not have heard is that early detection and treatment of HIV is itself a powerful strategy for preventing HIV infection and AIDS. There are two interesting studies in Health Affairs that document the importance of ‘treatment as prevention.’ I’ll get to these papers in a moment, but first let me provide some context. ‘Early’ treatment of HIV refers to this question: At what CD4 count should you initiate antiretroviral therapy for an HIV+ person? CD4 cells are critical components of the immune system. The CD4 count is the number of such cells in a cubic milliliter of blood. As HIV infections progress, the number of CD4 cells decline and this is a marker of the immune system’s declining ability to resist infection or cancer. Early treatment, then, means that you start treating the patient with antiretroviral therapy while his or her CD4 count is still relatively high ( > 350 cells / ml3), as opposed to waiting. When to start antiretroviral therapy has been controversial. There are plausible reasons to wait, including the significant side effects associated with antiretroviral drugs. However, when combination antiretroviral therapy (cART) appeared in 1996 and it was shown that you could live with HIV, early treatment became more common. One of the benefits of early cART is that it reduces the HIV transmission probability, that is, the probability that an HIV+ person could infect others through sexual contact. In the clinical trial 052 of the HIV Prevention Trials Network (HPTN 052), researchers found an astounding 96% reduction in HIV transmission among patients who received early cART. So, the question considered in a Health Affairs paper by Dana Goldman and his colleagues was: how many new cases of HIV infection have been prevented by the use of early cART treatment? They looked at the history of the US epidemic from 1996-2009. 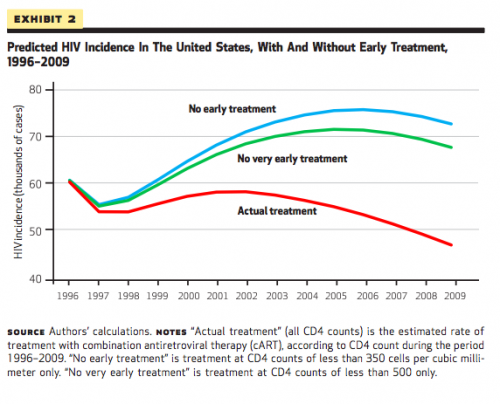 Obviously, we can’t (directly) count the number of HIV infections that didn’t occur. 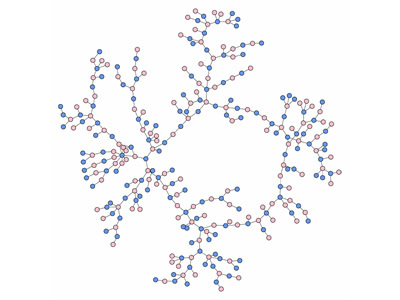 Now imagine that some of the nodes in the network are HIV+. HIV infection will spread through the network. But the rate at which HIV spreads, and therefore the number of new infections, will depend on the HIV transmission probability. And this transmission probability will be reduced if the HIV+ persons in the network get early cART. Goldman et al. ran their simulation under three conditions. In one condition, patients received early or late cART in the proportions observed during the actual history of the epidemic. In this condition, the simulated history of new HIV infections (the red line in the Figure below) reproduced the actual history of the epidemic from 2009 forward. Goldman et al. also ran the simulation under two counterfactual strategies in which doctors waited until CD4 counts were lower before initiating treatment. 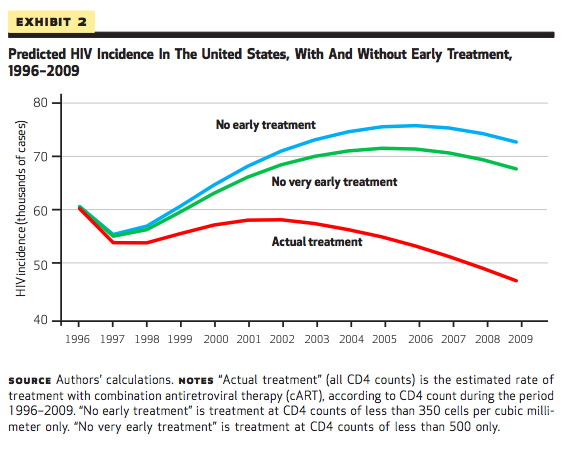 The blue and green lines depict how the history of the epidemic would have proceeded if early cART had not been used, and they show higher rates of new HIV infections. The authors concluded that the strategy of early cART prevented 188,000 new HIV cases during 1996-2009. In a related paper in the same issue of Health Affairs, Romely and his colleagues show that early cART also increased the life expectancy of HIV patients. Compared to people who initiated cART late…, those who initiated treatment early (with a CD4 count of 350–500) could expect to live 6.1 years longer, and the earliest initiators (with a CD4 count of more than 500) could expect an extra 9.0 years of life. [t]he total value of life expectancy gains to the early and earliest initiators of treatment was $80 billion, with each life-year valued at $150,000… The value of the survival gains was more than double the increase in drug manufacturers’ revenues from early cART initiation. The most important lesson is that it is essential to get people at risk tested for HIV infection. If you are HIV+ but do not know it, and don’t get tested, it’s likely that your disease will be found too late to benefit from early cART. That will shorten your life and endanger your sexual partners. A broader lesson is that the value of medical treatment is sometimes hidden. The prevention of 188,000 HIV infections is a huge but invisible public health achievement. People say that lives saved through prevention are “statistical abstractions,” but I don’t see it that way. We do not know the identities of the people who were saved—you may be one, but you will never know—or their exact number. Nevertheless, these lives are real, not abstractions, and saving them was worth the cost. The HPTN 052 trial cost an eye-popping $72 million and in the current state of funding for the NIH, I doubt that it would be undertaken. But the return on investment in cART, which HPTN 052 helped validate, is denominated in the billions. These aren’t billions that anyone can spend. Neither will the value of these lives be counted in measurements of our Gross Domestic Product. But the lives are real, lived by people who value them. For more TIE writing on prevention, see here, here, and here, and on HIV prevention specifically, see here.